The iPhone timesheet app that goes where you go. If you know how to use an iPhone, you know how to track time with TSheets. Your timesheets go where you go—so starting, stopping, switching tasks and submitting time is just a touch away. And with handy clock in/out reminders, overtime alerts, and an intuitive interface that remembers recent job codes and allows for annual leave and timesheet submission on the go, there’s no need to slow down to take care of business. No scrolling through menus or jostling with drop down buttons—just open the time tracking app, click on the job code, and start tracking time. Using that same one-touch functionality, you can also switch jobs, projects or clients, clock out, take a break, add notes to your timesheet, request time off or submit a timesheet for review. Track and coordinate your worker’s time on the jobsite. Supervisors can now clock in their crew, switch job codes, and clock them out—all from their iPhone. Say goodbye to punch-in time clocks and illegible time cards, and hello to a simpler, faster, more accurate way to track time. It’s all in one app—you get full time tracking functionality with GPS stamps for each employee or the whole crew. Supervisors can see who’s working and where, manage crew hours and overtime, switch employees to different projects for accurate labour costing, and add project notes. Office managers have full access to real-time data (never track down a handwritten time card again!) for simple payroll and billing. For safer job sites and faster response times. When your team clocks in from the TSheets iPhone app, you can see all their GPS locations on the Who’s Working map in your TSheets account—showing you exactly who’s on the clock and where they are at any point of the day. No need for additional GPS services. TSheets has got you covered. The GPS data is updated regularly throughout the day and again whenever employees change job codes, add notes, or clock out. You’ve got an accurate picture of everyone’s day whenever they’re on the clock—improving accountability, making it easier to find people in an emergency, and cutting down on wasted journeys. And the moment they clock out, GPS tracking is immediately turned off. The TSheets app for iPhone gives you a real-time window on your workforce anytime you need it. With a tap of your screen you can see exactly who’s working today and even which projects they are working on—all from the field. Want to add a job or a new customer while you’re on the go? 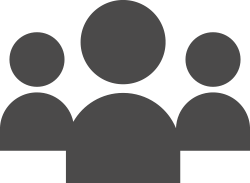 Need to check a timesheet or annual leave request before you get back to the office? No problem! You can do it instantly from your TSheets iPhone app and get on with the real job of running your business. Yes, you can track your time from 11,000 metres! No internet? No reception? No problem. Your phone may be dropping calls and your WiFi signal may be long gone, but your TSheets iPhone app will still be tracking time for you as accurately as ever. No matter where your work takes you, your timesheets are always up to date. You don’t need a phone signal or internet connection to use the app. You can clock in, clock out, change job codes, add notes—whatever you need to do—and all the data is stored on your phone. As soon as you’re connected again, just tap “sync” to get all your timesheet data back to the office. Switch to manual entry to create your own timesheets. 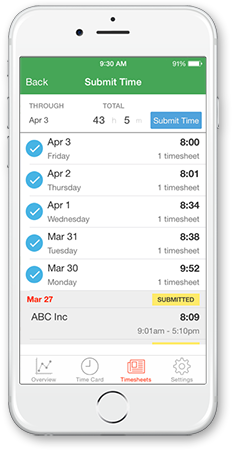 TSheets’ iPhone app is all about flexibility, which means you can track time your way. If you forget to clock in or out one day and still need a record of your hours, it’s easy to add them yourself by creating a new timesheet. Managers can easily see when employees have entered their time manually instead of clocking in and out when they start and finish their day. They can also see any notes or changes an employee has made to their time card—and as always everything is synced back to your main TSheets account.